The fourth ICNB project meeting was held in Sweden, Luleå 15th- 17th of August 2018, hosted by Sofia Lidelöw and Susanne Engström from Luleå University of Technology. Thursday morning was Project Management meeting and workshops. In the afternoon was “Municipality benchmarking seminar", with presentations by the head of Building Supervision Christer Andersson, developer Maria Wallgren and Building Inspector Martin Pantzare from Luleå kommun and Permit Architect Anneli Paakkari from City of Oulu´s Building Supervision. It appeared that the digitalisation of the paper drawings and permission documents is something what is under work in several municipalities, over countries. By Christer Andersson, Building Information Models has been used as help also in the Luleå´s Supervision of building but there is no established practice yet. The agenda on Friday included “BIM-related research and practices in Sweden". Thomas Olofsson from LTU gave presentation “Research and education". He pointed out McKinsey´s Report 2016 with “Five trends will shape construction and capital projects:"
Susanne Engström presented “Smart Built Environment project: Results concerning digitalization in construction”. Then Kajsa Simu (NCC/LTU) gave presentation “Online construction site”. We had also opportunity to hear practical experiences “BIM use in an architectural SME” from Albin Grind, Nordmark & Nordmark Arkitekter AB. Concluding two days of meetings and workshops was a visit to Lindbäcks Bygg AB´s factory in Haraholmen, Piteå. Lindbäcks is volume factory and the biggest contractor in Sweden which build wooden apartment houses with rooms as modules manufactured in their factory site. Factory manager Henrik Hauptmann gave us presentation and a tour inside the factory. He told how volume factory operates and it was inspiring to hear how open-minded they were. The factory and the operation of the factory were impressive. The visit at Lindbäcks served as wake-up call for building professionals since Swedish-Finnish-Norwegian consortium plans to set up a Nordic project for companies to advance their replicable, modular building process. Next ICNB project meeting will be in Alta, Norway in February 2019. Susanne Engström from Luleå University of Technlogy is presenting results concerning digitalisation in construction. One of the main aim of the ICNB project is to support the Small and Medium-sized Enterprises (SMEs) who are active in the building industry to increase their competitiveness by employing BIM as modeling. However, it is significant for the ICNB project’s stakeholders to be informed of the international novel progresses, ideas, innovations and current and possible future research and developments by sharing and exchanging knowledge with other international colleagues from universities, research institutes and industries in the building industry. 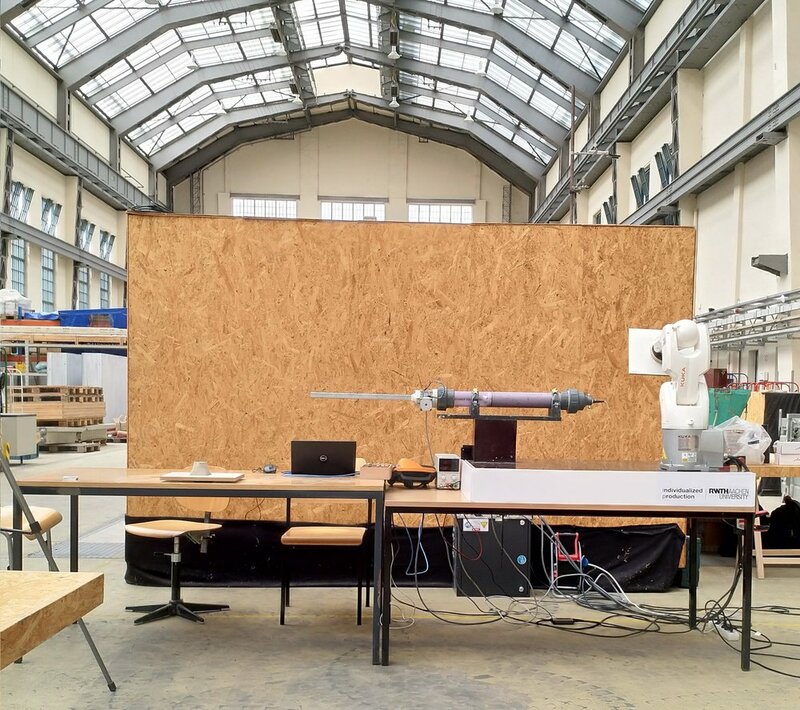 In this respect, the OAMK BIM team (Oulu University of Applied Sciences) presented a paper in the 35th International Symposium on Automation and Robotics in Construction known as ISARC and also participated in the International AEC/FM Hackathon, the construction robotics workshop. The symposium was organized 35 times and it attracted appr. 500 experts worldwide. 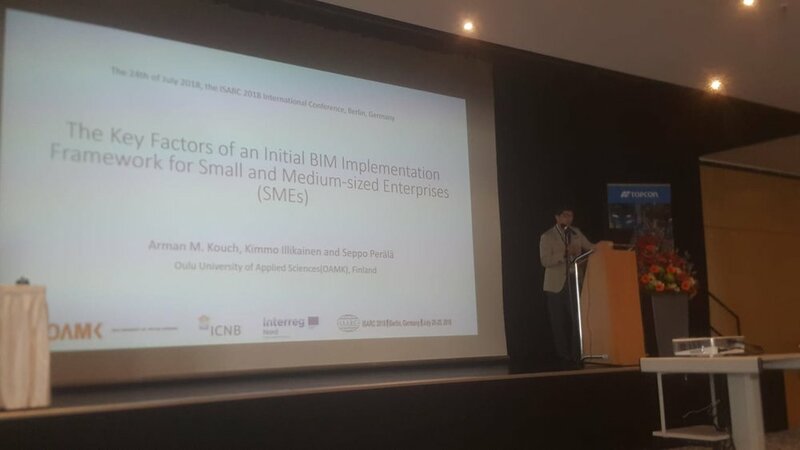 The presented paper “Key Factors of an Initial BIM Implementation Framework for Small and Medium-sized Enterprises (SMEs)”, authored by Arman M. Kouch, Kimmo Illikainen and Seppo Perälä, basically provides the realistic key factors for an initial BIM implementation framework based on the previous studies, shared knowledge and experiences. The proposed framework can potentially increase the contractors’ competitiveness and help them to understand BIM as modeling and employ it with less costs and more efficiency. Nevertheless, it was observed from the presentation Q/A session that what ICNB project is targeting and the SMEs knowledge of BIM are extremely necessary and the importance of the BIM technology for the SMEs are known to a limited extent which even shows much more related researches are required for the SMEs.